Long believes art is inherently a conversation with the viewer and in the case of a sculpture, with the environment as well. With sculpture, form and mass communicates something to a viewer. When a work towers over us, we feel dwarfed. When we must look down to see a smaller work, we have an Olympian perspective. Tensions especially evoke responses. Balance and movement affect us; whether a sculpture is firmly rooted, seemingly unmovable, or precariously balanced, ready to topple over in a blink of an eye. There is the push and pull between what is there and what is not. There are the contrasts of delicate and solid, bright and dark, interior and exterior. Of course, a viewer also contributes to the conversation, bringing expectations and formative experiences. As an artist, Long is in dialogue with his materials, and in some sense he structures the conversation between his artwork and its viewers. Art is visual communication, and he strives to pose a lot of questions but offer few answers. Question: Marcel Duchamp once said, “The viewer completes the piece” True or False? Why? 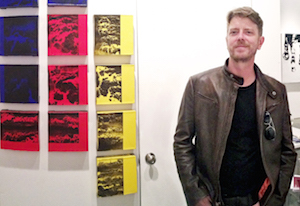 JP Long is a widely collected sculptor and artist residing in the San Francisco Bay Area; he is represented by fine art galleries in Chicago, Dallas, San Francisco, Sonoma, Palm Desert, and Toronto. Born in Boston, MA, he studied jewelry/metal arts at California College of the Arts. For over a decade, he has worked with internationally acclaimed artist Bella Feldman and shares studio space with her in Oakland, CA. Long’s career launched in the mid-2000s with a series of large glass-and-steel sculptures brimming with tensions and unexpected harmonies. 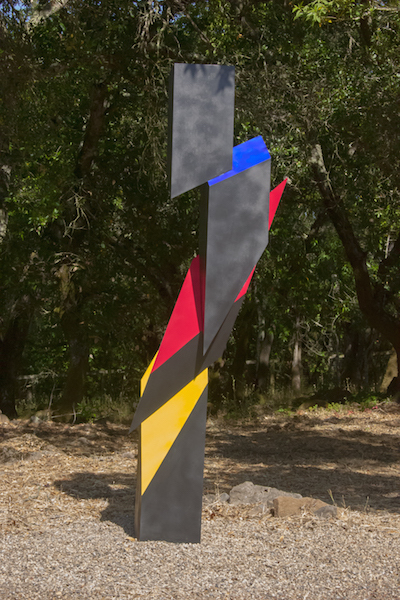 Impressed by the force of primary colors, he added planes of color to his steel sculptures—to striking effect. Long has also developed a series of canvasses parallel to his sculptural work, featuring breathtaking oxidation and carbon patterns, most recently against bold fields of color. Resonant with modernist geometry and a minimalist aesthetic, Long’s artwork probes spectrums of serendipity and structure. Controlled experimentation lends texture to his work—e.g., hand blown glass in his sculptures or unpredictable oxidation and carbon patterns in his canvasses. This technique, along with their eye-catching compositions, electrifies the pieces with a sense of impending animation. In his ongoing investigation of form, mass, and movement, Long imaginatively negotiates the physical capacities, as well as the conceptual opportunities, of his diverse materials.